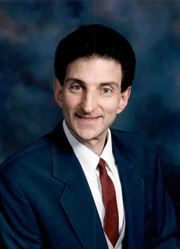 Dr. Bruce Goldberg is a dentist and hypnotheapist specializing in past life and future life therapy. He also has a Masters in Counseling Psychology. He has written twenty books including Past Lives, Future Lives and Search for Grace, which was made into a TV movie. He will conduct private sessions by telephone for $120 per hour and claims to have done over 35,000 regressions. One of Goldberg's major tenants is that time travel will be discovered in the year 3050 by a man named Taatos, who used the 'fifth dimension' to travel back to Egypt and also visit ancient Greece and Rome. 3050 is a golden age, he says, when people live 500 to 900 years due to a device called an alphasyncolarium which stimulates the adrenal glands and the gonads to produce DHEA, a hormone. He says that these time travelers' mission is to speed up our spiritual growth through genetic manipulation. When time travelers remain in this fifth dimension we cannot see them. Only if the slow down their vibration rate do they become visible. Atlantis, Mu, out-of-body experiences, and reincarnation also figure into his works. For example, he knows that Art Bell, the radio personality, had a past life in Atlantis 50,000 years ago where he was a geophysicist and quantum physicist named Draco. Draco correctly predicted the cataclysms that enveloped Atlantis, but wound up being killed in the catastrophe. Goldberg knows this because of his Akashic Record scan technique. Goldberg says the Men in Black are not above killing people, including Ivan T. Sanderson, Morris K. Jessup, and Ian Fleming, who was at the tome of his 'heart attack' was investigating not only the assassination of John F. Kennedy, but also the Philadelphia Experiment. He says there are four kinds of Men in Black. The first are government agents, the Black Brotherhood form the lower astral plane, the E.T.s, and time traveling Men in Black who hunt other time travelers, which is why the benign travelers stay in the 5th dimension where they cannot be detected. As to questions of Goldberg being a time traveler, he says that a true ‘chrononaut’ takes an oath never to reveal if he is or is not, and he would get in trouble with the timeline international security laws of the future. However, he reports meeting several time travelers in fifth dimensional hyperspace, such as Muat, Nirev, Al Sinoma, and Chat Noy, not to mention Osiris, Horus, and other Egyptian gods who revealed themselves as time travelers to the ancient Egyptians. One assumes they got into a heap of trouble for revealing themselves to him. Goldberg's proof for his many claims comes strictly from his hypnotic regression work. He charges $400 for one 1.5 hour session and suggests most issues can be solved with five sessions. Goldberg was a guest on The Paracast on November 11, 2007.